Some of you may have heard of the awesomeness that is HomeEc, taught by Leigh-Ann, Rachel, and Courtney. If you aren't sure what it is, basically those three lovely ladies decided to teach an sewing course online in blog format. You can enroll in the class and pay a small(ish) fee, and gain access to tons of project tutorials, help videos, discussions with other students, and even live chats with your teachers! I was super excited about this class because I've been wanting to learn how to sew. I've known how to sew for a while, but I wanted it to become something I was more excited about, and something that I was more confident in. I'd love to become one of those instinctive sewers, where I can do anything without any trepidation. I signed up for the class the day it opened, and I've been so excited! Due to some financial restraints I've gone a little slower with the projects than some of my classmates, but it's ok because these posts will be up for a whole year! The first project I did through the class was double sided napkins. 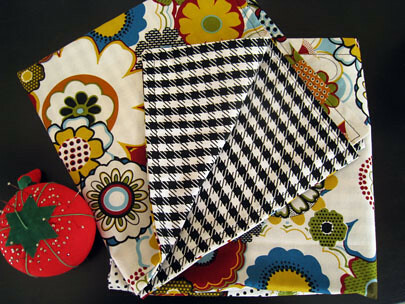 I used a crazy mod floral print and a regular black and white houndstooth pattern. I really liked the way they looked together, and it was one of those things where at 2am I decided I needed to start sewing these because I was so excited! Unfortunately, I didn't realize how important good cutting equipment was at that point. I cute these squares on the carpet, with fairly dull scissors, using a measuring tape as my guide! Let me just tell you, that was not a good idea! They were really uneven, and it made it really hard to sew nice lines. Well, the next day I called my grandma and borrowed her self-healing mat and bought myself a rotary cutter, and it is so much easier! 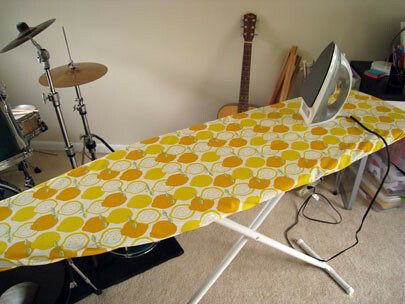 One of the projects I was most excited about when I signed up was the ironing board cover. 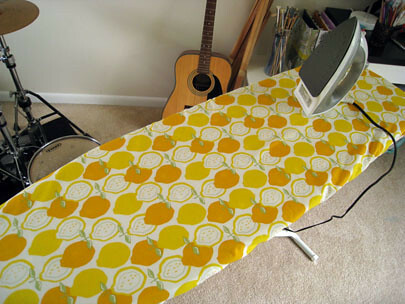 I didn't even have an ironing board until three days ago, but I knew that I would buy one eventually and that I'd HAVE to cover it with the lemon print fabric I've been obsessing over for the last few months! I've seriously been saving it and cherishing it since March or April, and everything I've thought of using it for hasn't been good enough, until now! I had originally only bought a yard of it, but luckily JoAnn's still has it in stock so I bought two more yards to make the cover. I still need to find ironing board clips for the underside to make it nice and taut. My little sewing corner. I got the spool holder on sale at JoAnn's for half off (so I spent $7.49), plus I got 40% off of the lemon print fabric, so I ended up saving a whole bunch of money! I really can't wait until I fill up the spool holder with all the colors of the rainbow! 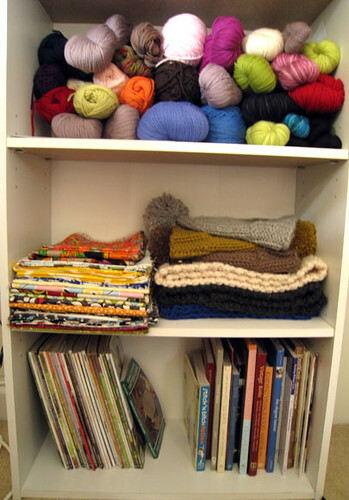 My little stash is growing, but it's nothing compared to my yarn stash! Remember how my mom sends me boxes of vintage goodies every once in a while? 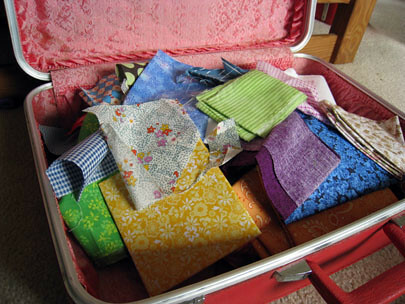 She always throws in a few little fabric scraps, some of which are pretty vintage patterns. It's always a little bit of a bummer though, because some of the fabric is amazing, but the pieces I have are too tiny to use! Now they have a nice home in my little suitcase though, so I can look at them whenever I want! I tried to do a video tour of my craft room today, and ohmygosh it was embarrassing! I said things wrong, held the camera and unattractive angles, and awkwardly talked about things. I don't know if I'll post it, or maybe I'll shooting it again if it's something you guys are interested in...? Aww if I had a sewing machine I so would have taken this class! Your nooks is adorable! And I love the fabric you've been choosing. i love how you decided to display the scrap fabric! so cute! i want to see the video! :P and where on EARTH did you get that rad first fabric?! beauttttiiful! i love all your craftiness! I loved your dress from the last post! I can't wait to see what you create in this class! You always make the prettiest things! Seriously, I'm coming to live in your craft room!!!! I have my yarn in a HUGE bin and still have 4 huge bags full - my aunt works at a thrift store and has given me so much, sometimes I even get 6 balls same dye lot!! I want to learn to sew but I don't have a sewing machine which is a definite down point on the learning!!! 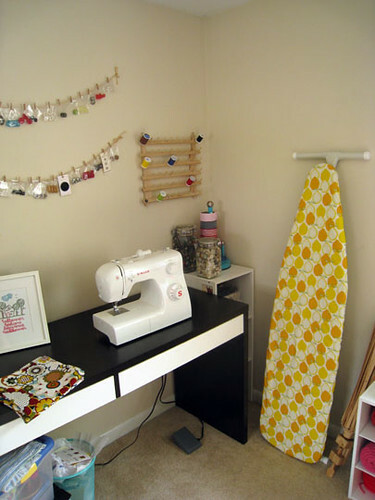 I love your sewing corner! So cute and organized! 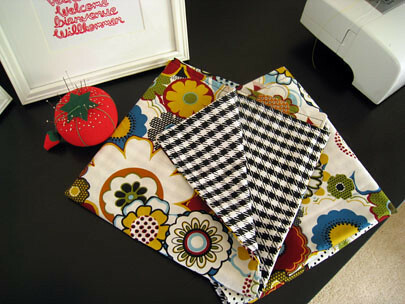 I love the ironing board cover, I'm making an apron with that same fabric! The fabric from your mom is cute in the little display you made, have you ever considered learning quilting? You might be able to use the fabric for that!